Join Goodwill of Middle Georgia & the CSRA for our monthly Lunch & Learn at the Goodwill Middle Georgia Job Connection Career Center the first Tuesday of every month from 11:30 am - 1 pm. The Goodwill Middle Georgia Job Connection Career Center is located at 306 Russell Parkway, Warner Robins, GA 31088. 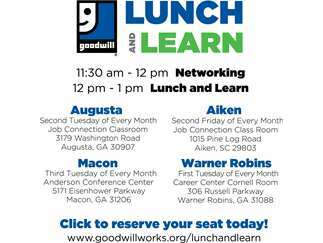 Network from 11:30 - 12 pm and then enjoy lunch & learn about Goodwill from 12 - 2 pm. Not located in Warner Robins but still interested in attending one of our lunch & learns? Reserve your seat at one of our other locations in Macon, Augusta and Aiken via the link above.